“When I saw it, I said, ‘Ooh, this looks good for research in Africa,'” says Julia Royall, chief of International Programs for the National Library of Medicine (NLM) Office of Health Information Programs Development. 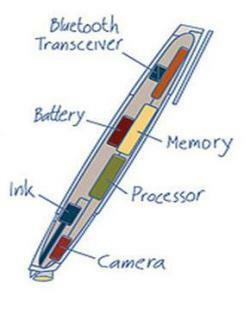 “It” is a digital pen, featuring a tiny camera, “smart paper” information form, and computer data collection, storage and transmission application. A team of medical students from Uganda’s Makerere University Faculty of Medicine are using the pen to conduct an observational survey. They are recording how 300 families in Mifumi, a remote village in the eastern district of Tororo, are using bed nets to protect themselves from malaria carrying mosquitoes. The World Health Organization has reported a child dies of malaria every 30 seconds in Africa. “Research data in Africa is usually recorded on paper in the field, collected, and sometimes bounces off trucks in transit to data entry people who may not be connected to the research. As a Kenyan colleague told me, it takes a very strong truth to emerge,” Royall recalls with a wry smile. Royall came to NLM in 1997 to respond to a call from African malaria researchers for better access to the Internet and medical literature. The result was the Multilateral Initiative on Malaria Communications Network (MIMCom), a component of the Multilateral Initiative on Malaria. Under her direction and with partners in Africa, the US, the UK, and Europe, MIMCom started with two research sites in Kenya and grew to comprise 27 research sites in 14 countries. 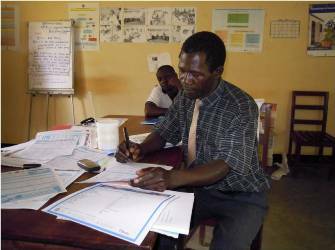 The focus of international partnerships like MIMCom is on outreach to researchers, physicians, and librarians in developing countries, with an additional more recent emphasis on health workers and end users. MIMCom is one of several NLM international programs and outreach efforts. Royall is passionate about the potential of information technology to make a critical difference in Africa’s battle against malaria, for one. Prior to the digital pen project, she coordinated another team of Makerere medical students, faculty and artists to develop a malaria electronic tutorial—the first MedlinePlus African Tutorial on Malaria for Africa. The goal is to integrate the resulting data from Mifumi into the Electronic Health Management Information System being pioneered at Tororo Hospital by Simon Ndira, a computer scientist. He, Royall and Wei Ma, chief of the Applications Branch of the NLM Office of Computer and Communications Systems (OCCS), are the project leads. At Royall’s request, Ma and her team—Chandra Kola, Matthew Rothstein and Vini Bhatnagar—worked with the Ugandan student team to design the smart form, supplied the pens, charging cradles for the pens, and clipboards to hold the forms. May 21, 2010 in Products, Programs & Services.